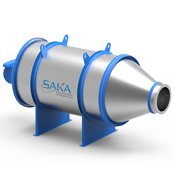 Provide desired heat to your dryers and process plants with SAKA’s wide range of Hot air Generators. GET HOT AIR AT DESIRED TEMPERATURE, SAFELY! 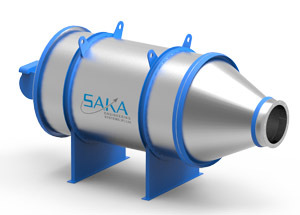 SAKA has a full range of Hot Air Generators or Air Heaters. Our Hot Air Generators (HAG) comes with robust and sturdy design to provide you required heat consistently and in safe manner. 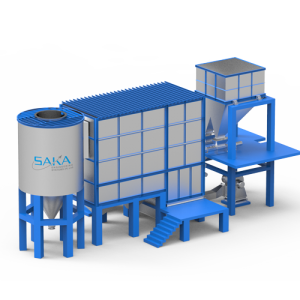 Known for its compact design and fail proof arrangement SAKA make HAG are ideal for wide range of industries right from Chemical to fertilizer to Food. SAKA’s fully automatic HAG are extremely easy to operate with just push of button and does not require specially trained resource. Known for its economical efficiency our HAG can provide clean and safe hot air making it ideal choice for food and pharmaceutical industry. 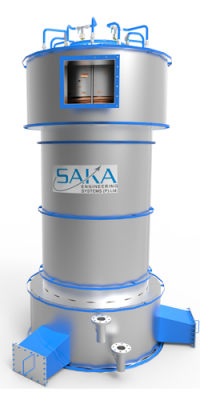 SAKA’s Oil/Gas based Hot air generators are known for high efficiency and minimum maintenance. Theses Fluid Bed combustion based HAG comes in two designs i.e. Vertical as well as Horizontal.Our HAGs are extremely economical and can be operated with a low cost fuels, available locally. Indirect HAG are ideally used where clean and contamination free air is required. Here Combustion is completed within the chamber and heated gas passes through heat exchanger comprising of second, third or fourth pass. 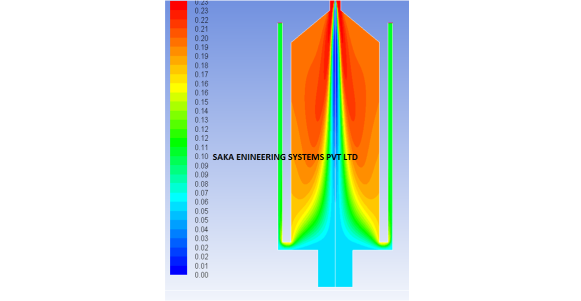 Fresh air passes onto surface of combustion chamber with help of a blower, shape of the passage is such that maximum heat transfer is possible, generating hot air in just few minutes of its start. 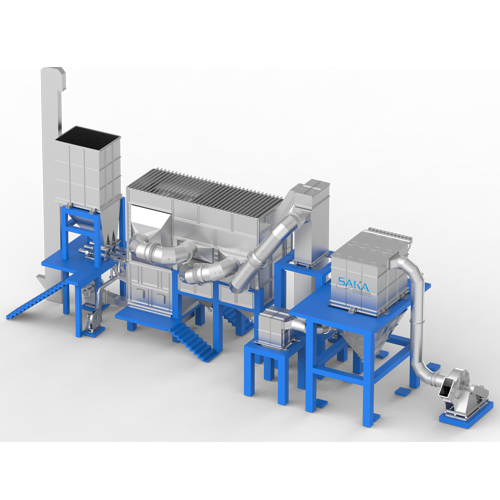 Indirect HAG can supply fresh and clean air up-to 450 degree C. with overall thermal efficiency of 80%. 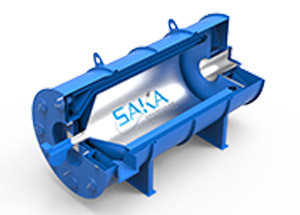 Direct fired HAG is used for applications where hot flue gas can also be used. 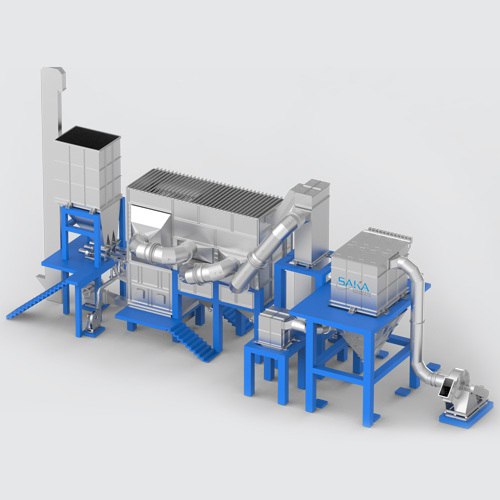 the combustion chamber is enclosed in a concentric shell with suitable (refractory) lining. The fresh air fed to the chamber. The air envelopes the combustion chamber and absorbs the radiant heat from its surface and then mixes with completed combustion gases in a conical chamber. Such heating systems have very high thermal efficiency with proper insulation. Direct HAG can supply hot air up-to 700 degree C. with overall thermal efficiency of 95%. 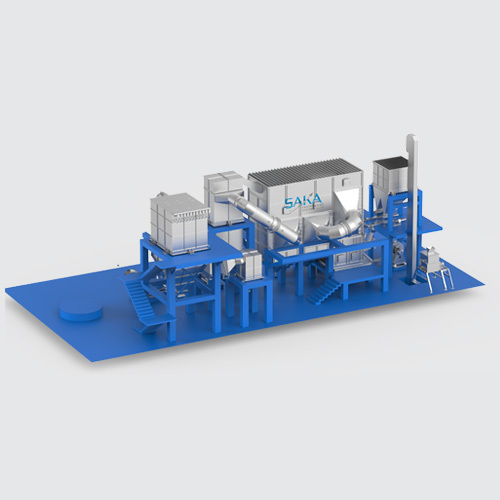 Solid fired HAG uses Wood wastes (such as bar, chips saw dust) Agricultural wastes (such as husks, ground nut shells, cotton stacks, soybean shells etc) or lignite, coal solid waste as fuel. 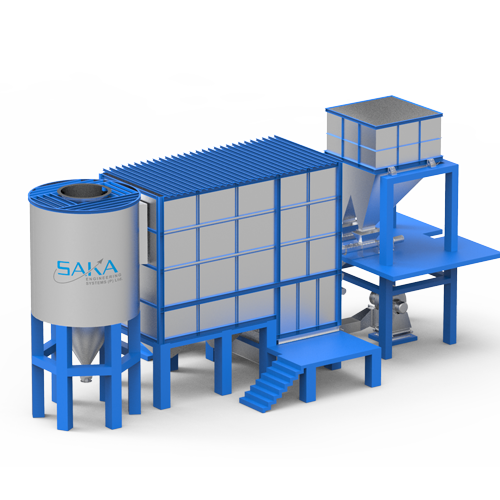 SAKA’s Solid fired HAG are extremely efficient and have high heat transfer area. Solid Fired HAG comes in two models i.e. vertical as well as horizontal and has huge edge over other types HAG due to low operational cost. Indirect HAG are ideally used where clean and contamination free air is required. Here Combustion is completed within the chamber and heated gas passes through heat exhanger comprising of second, third or fourth pass. Fresh air passes onto surface of combustion chamber with help of a blower, shape of the passage is such that maximum heat transfer is possible, generating hot air in just few minutes of its start. 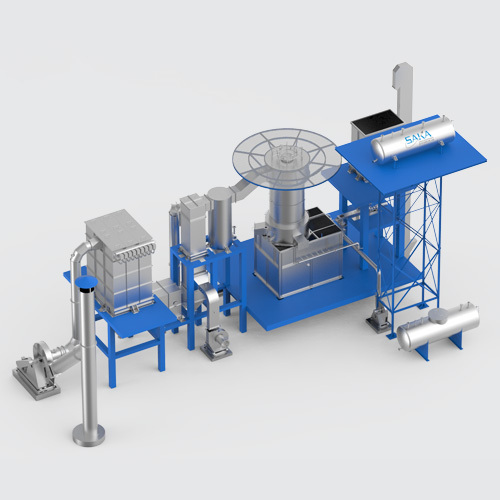 Indirect HAG can supply fresh and clean air upto 450 degree C. with overall thermal efficiency of 80%. Direct fired HAG is used for applications where hot flue gas can also be used. 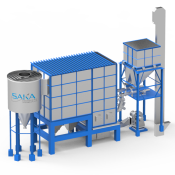 the combustion chamber is enclosed in a concentric shell with suitable (refractory) lining. The fresh air fed to the chamber. The air envelopes the combustion chamber and absorbs the radiant heat from its surface and then mixes with completed combustion gases in a conical chamber. Such heating systems have very high thermal efficiency with proper insulation. Direct HAG can supply hot air upto 700 degree C. with overall thermal efficiency of 95%. 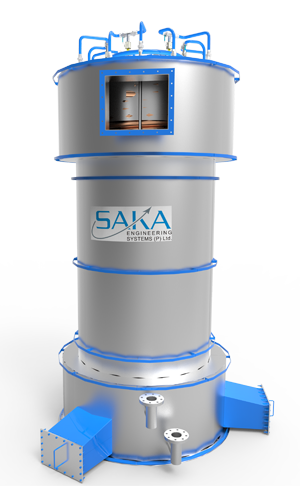 SAKA manufactures complete range of Electric Heaters, widely used in all the industries due its high level of flexibility our heaters are highly regarded for their performance. Also known as Flanged Electric Heaters, these heater comes with hairpin bent tubular elements welded onto the flanges. These tubular elements are controlled by centralized circuit box and connected by wires. Air is passed through these element by FD blower to makes air warm for drying process. Electric Heater are highly safe as it does not require internal burning, totally eliminating risks such as explosions and carbon monoxide poisoning. 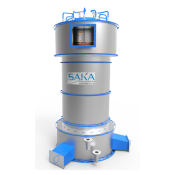 SAKA offers comprehensive range of Steam heaters like Directly fired or Indirectly fired, which are widely used for providing warm air for dryer, ovens, spray dryers and other applications. 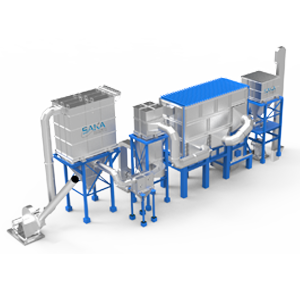 Our fully automatic Steam Heater offers many advanced features as compared to traditional heat exchanger. offering excellent efficiency when it comes to noise, water hammer, vibrations, and scaling, Our heaters are known for high thermal efficiency and proper insulation. Unique expansion type arrangement ensures longer service life.